"After a period of 5 years no further Jewish immigration will be permitted unless the Arabs of Palestine are prepared to acquiesce it." 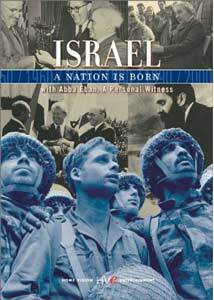 In the tradition of, and as a follow-up to the 2000 release of Abba Eban's Heritage: Civilization and the Jews, Home Vision brings his Israel: A Nation is Born to DVD. This six-hour, six-part documentary serves as both a history of the young nation state and a professional biography of Eban himself, for he was active in, at first, the military arena as a British major, later to become the sympathetic and formidable voice on the international diplomatic stage representing his adopted homeland in its first three decades. Eban presents the story of modern Israel through both historical events and personal, firsthand recollections of many of those who lived them, using an array of international newsreels, archival film footage, and photographs as well as both modern and vintage interviews that, while heavily weighted toward the Zionists and eventual Israelis, also include those of world Arab leaders and local citizenry, the eventual Palestinians. Many of the images incorporated here are outside the realm of those most commonly shown; these are not the frightened Jews of the early years of World War II, nor are they the shuffling, near-death survivors of human atrocities. These are men and woman, high school girls and boys with both guns and determination, for whom the Holocaust is not a memory, but a vivd chapter in their own lives. These are not the Hassidim of Orthodox Jewry seen davening in dark synagogues, bent over books and praying for deliverance—these are the people who will fight, if they must, for the right to survive and govern themselves. One can only be impressed and deeply moved by the will of the Jewish people to secure a safe and lasting homeland given their long and tragic history. The evolution of the state and its government is set out clearly; what is still not clear to me, after viewing the combined 15 hours of Eban's two series, is how and when the now raging animosity between the Arab world and the Jews began. It seems it is not "centuries old" as it is so often described; rather, it was born in the 20th century. While the first Zionists were tolerated or even welcomed, at some point this living side by side disintegrated. These documentaries may not have all the answers, but go a long way to provide a deeper understanding of this troubled region. In the end, I am personally left with the knowledge that, having never lived daily in the shoes of either side of this ongoing conflict, I cannot judge, let alone condemn any but the most violent actions perpetrated against the other. For the Israelis, the main objective is unquestionably a matter of survival; for the displaced native Arabs, it is self-government. Neither will accept a state without Jerusalem, and both sides have grown terribly fractious—and so it continues. This episode discusses those world events that shaped the birth of the Jewish state. Jews in Europe and Israel track Hitler's mandated anti-Semitism and his conquest of North Africa; Eban's personal account of his first arrival in Israel—as a British officer, he was entrusted to assist as liaison in the endeavor to beat back the German advance. Arab nations generally supported the Nazis. On film, Anwar Sadat says, "It was very simple. Germany is the enemy of our enemy, England. So the enemy of our enemy is our friend." Fighting alongside the British in the battle of El Alamein, Palestine's Jews helped save themselves from German extinction. The Jewish determination to have a homeland begins. Now freed of their captors, they are a people dispossessed, counting heavily on the British pre-war promise (the Balfour Declaration). Pan-Arab leaders protest. The Jews argue for, at very least, the immigration of holocaust survivors. Eban offers, "To our astonishment, and I think to the world's horror—especially to President Truman's horror—the British foreign secretary, Ernest Bevin, continued to keep that gate closed." The disastrous politics of oil. The Irgun bomb the King David Hotel, an act condemned the world over as terrorism. Eban leaves the British Service to permanently join the Zionists. The British toss the issue to the UN; no one stands behind Zionists. Andrei Gromyko, Russia's ambassador is the first to offer a partition. A UN team witnesses the arrival of a boat of survivors turned back and are moved.A Saudi delegate remarks, "To the Jews, politics was a science." In 1948, Israel becomes an independent state. Arabs—Egyptians, Iraqi, Jordan and Syria—begin to invade on the same day. "If I forget thee, o Jerusalem�"
May 14, 1948: "Come what may," independence is declared by a 6-4 vote of Israeli leaders. Eyewitnesses tell the battle for Jerusalem, which is surrendered at first to Arab forces. General Herzog is on hand in a vintage interview to discuss the battle of Latrun, which is illustrated by clips from MGM's Cast a Giant Shadow. War refugees still stranded in European camps were now free to immigrate. Israelis win in the Negev and Egypt is first to negotiate an armistice. Israeli forces capture Galilee. Israel gives rights to Arab refugees immediately; denizens of Jewish communities in Arab countries are treated as political pawns on world stage. Airlifts and assimilation of another 250,000 Jews from Arab states into Israel's population. Arabs who remained are welcomed as citizens with equal rights civilly and politically. In 1951, Israel is admitted as a member of the United Nations, and the dominant era of Abba Eban's oratory prowess in Washington and the UN begins. The documentary includes several vintage clips of President Harry Truman and Ralph Bunche, the latter of which won the Nobel Prize for Peace. In the three years from 1953 to1956, Weitzman dies; Truman leaves office and ben Gurion retires. The British still hold the Suez canal, a buffer for the young state against Egyptians; Nassar soon persuades British military forces to leave. Railroads end abruptly on all frontiers; Israel is cut off on all sides, experiencing a "choking sense of desperation and solitude." Nassar angers the world by capturing the Suez canal. In 1955, Israel find its first ally as a member state, France, and acquires new French aircraft. In 1956, France and England split from Washington, deciding to use force in Egypt. In this theater, Moshe Dayan, Ariel Sharon and David ben Gurion strategize victory with their new European allies. The world concurrently ignores Soviet aggression in Hungary while the three nations are chastised for theirs. Eban speaks at the UN about the need to fight in cases of self-preservation. The US pressures France and Great Britain to withdraw; Israel is again alone until 1957, when the United Nations creates their first peacekeeping force to keep the Strait of Tiran open. This period of Suez proved French and British imperialism was waning, and saw the rise of the US as a world power. The focus of this program is the famed Six-Day War and the results thereof. When Nassar again takes the Strait of Tiran, Israelis build air raid shelters and area kibbutzim are fortified. Arab-language radio promises total annihilation. Eban, now foreign minister, goes to Washington to meet with President Johnson, then de Gaulle in Paris, to no avail. Britain proclaims the strait an international waterway and backs Israel. World protests are pro-Israel as they face the Six-Day War. Israel pre-empts the Egyptians, destroying much of their air force. Ariel Sharon leads the ground battle in Sinai. Israelis capture the West Bank. Success runs from the Golan in the north all the way to Suez in south. For the first time, Jerusalem is in the hands of the Israelis; Jews have access to the Temple Mount, which was barred to them for 19 years. Jerusalem undergoes unification and rebuilding, and the erecting of the new city outside the ancient walls begins. Volunteers arrive from all over the world to support kibbutzim. Palestinians are no longer Jordanians but Israeli citizens, sharing in the new economic prosperity. Israelis hunker down to protect their borders in occupied territories. Golda Meir becomes prime minister. The US is now Israel's principal ally. Eban meets constantly with Nixon hoping for negotiations. Nassar dies in September 1970. Revolutions are on the rise in the Arab world. The PLO and Arafat begin bombings in civilian centers, flee the West Bank for Jordan, and attempt to remove King Hussein. Jordan's army battles the PLO; survivors move on to Lebanon. International terrorism begins in Munich in 1972 at the Olympics. A general complacency grows within the population with the relative quiet of the past decade. On the Jewish High Holy Day, Yom Kippur, the army is put on low alert; almost too late, intelligence reports make it understood Israel would be at war on all borders by morning. For the first time in its brief history, the unthinkable happens: the army is not prepared for the onslaught to come, and Israel's future looks grave. The Geneva peace conference over which Kissinger and Gromyko preside sees Anwar Sadat come to the table—his troops were surrounded still in the Sinai. The public hold Dayan responsible for the military's lack of preparedness; Golda Meir resigns. Menachim Begin becomes Prime Minister, lays claim to Judea and Samaria—the "West Bank." Palestinians feel outside society. In November 1977, Sadat arrives in Israel and addresses the Knesset. The peace process had begun. Jimmy Carter becomes the first American president to put the office on the line for peace in the Middle East. On March 26, 1979, an agreement is signed on the White House lawn. Sadat is assassinated by Egyptian extremists. The Palestinians see the Israelis as less of a super power, more vulnerable, after the Yom Kippur War. Iraq threatens nuclear attack; suicide bombers multiply. Minister of Defense Ariel Sharon condemns these actions publicly and marches toward Lebanon to crush the resident PLO. This action would divide the country; peace protests break out nationwide. King Hussein makes peace to resolve the West Bank situation while the Intifada—Palestinian Nationalism—unites the refugees, but also the Israeli people against them. Secular and religious factions clash. In the 1980s, there is the first Gulf War, and peace efforts by Presidents Bush and Clinton. Israel enjoys a more modern world society, and again sees a boom in the immigration of Russian Jewry. Fourteen thousand Ethiopian Jews arrived in a single day. This additional program was produced in 1997, five years after the original five episodes. As such, there is much more depth and detail provided for the more recent past. The road to the Oslo Accords I and II is covered in detail by the people who paved it, including Yitzhak Rabin and Yassir Arafat. The subject begins with a quick overview of Israel's six wars, and the emergence of Arafat and the PLO. This hour includes many more contemporary interviews, featuring Egyptian President Hosni Mubarak, and Israel's Binyamin Netanyahu. Focused on more current (to 1997) events, this particular episode is an informative study of the contemporary saga. Even as the leaders grow closer to a compromise, the citizenry splinters, extremist fundamentalism wreaking havoc on both sides. It is clear, however, that the majority of the population longs for peaceful resolutions. In closure, Eban urges an end to the cycle of violence that threatens to dismantle the trust, piece by piece. His words are frighteningly prophetic. Image Transfer Review: Almost six hours of programming from so many varying sources is a challenge, but overall, accepting the vintage nature of the footage used, this transfer does its job admirably. The early programs consist of mostly black-and-white footage; Eban's segments suffer in color, his fleshtone is so uneven it ranges at times from natural, to purplish, to even greenish hues. In the modern episodes, especially On the Brink, the color is much more even and correct. Audio Transfer Review: The audio track services the series quite well. Ambassador Eban's voice sets the tone, with various results embedded in the source material made as clear as possible. Oddly, about seven minutes in to the fourth episode, the audio jumps remarkably louder. "In diplomacy, one gains more by the folly of adversaries than from one's own wisdom." Abba Eban died in November 2002, and Home Vision offers these items in memorial: A 12-minute tribute to his long and celebrated career, in which Henry Kissinger among others lauds him as a great orator "steeped in history"; a six-minute interview with Shimon Peres; letters of tribute and condolence addressed to his wife, Suzy, by world leaders and friends, US Presidents Carter, Clinton, and the senior Bush; US Secretaries of State Kissinger and Powell; the King and Prince of Jordan, and the president of Egypt included. A multi-screen timeline parallels Israel's history with the larger view of world history, which again appears in print in the accompanying booklet that also contains Mark D. Charney's obituary article from the New York Times. Subtitles are provided in Hebrew, Russian and Spanish. Menu design is far above what one has come to expect for documentary releases; kudos again to the team at Home Vision. Abba Eban's Israel: A Nation is Born in another elegant and important presentation from Home Vision. As is true with the earlier series, Heritage: Civilization and the Jews, this program is a deeply informative and educational study, this time focused more directly on the history of the ongoing tensions in the region. Highly recommended.